On Friday the boys ans I along with their Great-Auntie went along to Willows Activity Farm in London Colney, near St Albans. If you have read my blog before you will know that we absolutely love our trips to Willows as we live locally to it. For the Easter holidays, well on all school holidays really,Willows always put on amazing events to keep your little ones entertained. This Easter is no different with their exciting Easter Eggstravaganza! From the 6th until the 22nd of April the Easter Eggstravaganza programme is running and is jam packed full of family fun. All day long there are arts and crafts running along with the usual farmyard, indoor and outdoor play areas, pat a pet, panning for gold, woodland trails and the Peter Rabbit attractions. On entry you are given the programme so you know where to be and what is on at various times during the day so you don’t miss out on anything. You are also given a hunt challenge where you have to find the answers to the given questions around the farm. At the end in the shop you hand in the completed form in exchange for chocolate. We arrived at 11.30 and it was perfect timing as we went straight to meet Peter Rabbit and Benjamin Bunny. The children can cuddle their favourite bunny’s and have a photo taken with them. We then headed straight to the farmyard to feed all of the animals. There are lots of baby lambs and goats and a baby calf too. The boys we fascinated by ‘Milktray’ the cow who is due her baby calf any day. The staff and vet were checking on her as she was showing signs her baby could be born soon. Oscar so wanted to see the calf being born and we literally had to come back and keep checking on her every half an hour or so. By the time we left the baby calf still hadn’t been born, but we keep checking daily on Willow’s social media to see if it has been born yet. This is one of the amazing things about Willows, you get to see everything and last year the boys got to see lambs being born. It’s an amazing experience for them. We then went on a ride on Tristan The Tractor who drives you through the animals out in the fields and the trees are decorated in Easter decorations and for the duration of the ride the children can sing along to their favourite farm songs. We then headed back to the farmyard to check on Milktray and watched the baby lambs being bottle fed. Oscar and Archie each held a guinea pig in the Pat A Pet section in the farmyard and Auntie Liz loved cuddling the guinea pig too, she didn’t want to give him back. The boys were feeling peckish so we walked up to the light bites cafe as the main Peter Rabbit burrow cafe is closed for its refurbishment. In the light bites cafe you can get sandwiches, baguette’s, panini’s, pizza and jacket potatoes along with drinks and crisps. Oscar and Archie had a kids deal where you can pick 5 items and a drink and Liz and I had a sandwich. The food was really nice and good value too. We walked across the farm to where the Easter egg hunt is located. of course checking on Milktray on the way. Each child is given a basket and then there are five different coloured eggs hidden in the activity acre. They always decorate it so nicely and all the children have great fun racing around trying to find the eggs. When you have found one of each colour you take your basket to the egg exchange and each child gets five chocolate eggs. By the activity acre is the fantastic Peter Rabbit adventure playground. Every time we come here I am always amazed and how great this is. For the children it must be like being in an episode of Peter Rabbit. You can play in Peter’s tree house, Mrs Tiggywinkle’s house, Mr McGregor’s garden and Mr Tod’s Lair which is near to the bouncy castles and outdoor adventure play area. A few people have said to me that Willow’s Activity Farm is a bit on the pricey side but when I explain that absolutely everything apart from food inside the farm is included in your entry ticket price, they then see what good value it is. Willow’s is a full day out with so much to do and see. 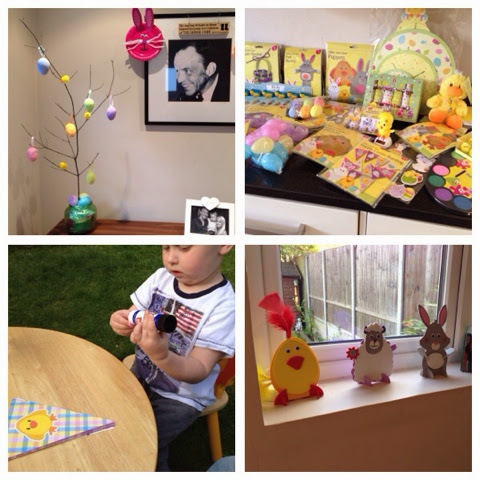 We had such a lovely day out on Friday and it was great fun doing something Easter themed. You can save money by purchasing your tickets online before your visit. On the day an adult ticket for the Easter Eggstravaganza is £22, children over 2 are £23, adults over 60 £21 and a disabled adult or child is £13. You book tickets HERE. Disclaimer: We were given complimentary tickets to attend the Willows Activity Farm Easter Eggstravaganza in exchange for a review. Today we were invited for a day out at Willows Activity Farm in London Colney, Hertfordshire to the opening of Mr Tod’s Lair and their amazing Easter eggstravaganza programme. We arrived at the farm at 9am for a lovely breakfast that had been put on for us and then a meet and greet with Peter Rabbit and the naughty Mr Tod himself. It was lovely to see the lovely Ruth from Rock N Roller Baby and Carolynne from Mummy Endeavours and their children. We were then taken to the brand new Mr Tod’s Lair adventure playhouse which is absolutely amazing with tunnels, a Mr tod’s play kitchen and slides. The boys loved it and had lots of fun playing in it. There is also a new Mr Tod’s tasty treats kiosk with the most amazing smelling doughnuts and Super Squirrel Nutkin test agility course. We then went around the rest of the farm using our Easter Eggstravaganza programme so that we didn’t miss out on anything. It is jam packed full of fun for all of the family to enjoy and is a full day out! We took our Friends along with us and their daughter and they absolutely loved Willows and couldn’t believe how big it is and how much there is to do. We walked around the farmyard and fed the animals and held a guinea pig. The Easter chicks that have just hatched are adorable. We then went on Tristan the Tractor who drove us around a circuit surrounded by cows, sheep and pigs and through the decorated Easter scene. It is very sweet, with Easter songs playing for the children (and adults) to sing along to. As you are walking around the farm you also have a fun hunt and you have to find the answers hidden around the farm and then at the end of the day hand in your completed form to claim your prize! Next up was the watched the cow milking demonstration and then the Peter Rabbit show. The Peter Rabbit and friends costumes are so good, just like in the hit TV show. Archie is Peter Rabbit mad at the moment after watching the Peter rabbit movie last week and absolutely loved seeing Peter today. He was a bit wary of Mr Tod! We then went in the Peter Rabbit adventure playground which is amazing, the boys love it. It is full of musical instruments, interactive games and outdoor play. It is perfect for the dry weather and you can sit for ages watching the kids have fun in the treehouse, Mrs Tiggywinkle’s house and Mr McGregor’s garden and potting shed. We then placed our bets for the Pig Race. It’s hilarious watching the pigs race around the track and all the adults getting super competitive. Over by the animal race track is the holiday events showground which obviously at the moment is set up for an Easter Egg hunt in the Easter Garden. You have to find 5 different coloured eggs to then go to the egg exchange and get five chocolate eggs. We went for lunch inside the Woolly jumpers play barn, the boys had a kids meal deal and we had a salad and a jacket potato. They have a massive menu with something for everyone. The four of us ate for around £20. The boys then went into the soft play to run around and go on the slides. After lunch and a play we went back outside and went on the playground and the woodland play trail. We had such a lovely day as always at Willow’s! The Easter Eggstravaganza programme is running from today the 24th March until the 15th of April and would make a great family day out during the Easter Holidays. If you book your tickets online you will save money, your ticket price is all your pay and everything inside the farm is included; the fairground ride, inflatables, tractor ride etc is all included. On the door for the Easter Eggstravaganza, adults are £21, children over 2 are £22, under 2’s are free, over 60’s are £20 and a disabled adult or child is £12. Like I mentioned above you can save money by booking online prior to your visit. We will be going back in the Easter holidays to do it all again as its just a fantastic fun filled day out! As a Poundland Ambassador I always look forward to the different tasks we are set throughout the year. As it is Easter we were sent some vouchers to go to our local Poundland and see what they had to offer. Oscar has three weeks off for the Easter holiday’s so stocking up on arts and crafts bits from Poundland always keeps him amused. Poundland have lots of fun arts and crafts bits for Easter and I got loads for Oscar. I brought a selection of decorations to make a Easter bonnet and the bonnet itself. I really liked that they had a baseball cap type bonnet so boys can make a boyish one too instead of the usual bonnet. Oscar loved making his and we added ribbon, nests, lambs and flowers. It is a really fun, simple and cheap activity and Oscar is taking his bonnet in for show and tell on Tuesday. I also brought a cupcake baking tray, two packets of mini eggs, a Easter cooking apron, a Easter chef’s hat, cup cake decoration kit and we baked some very yummy cup cakes which the grandparents loved on the weekend. I think the apron and chef’s hat are fantastic and they are good quality and can be used over and over again! I also got a pack of Easter cards that Oscar can make, a egg decorating kit and an egg holder to make it easier to paint them. We also got another egg decorating kit which came in a egg box with a china egg inside and a paint brush and paint and bunny feet and ears. Oscar painted the egg and add the ears and I drew a bunny face on it. It has made a lovely Easter ornament that I will get out year after year. We also made the felt ‘Happy Easter’ banner which looks great by the kitchen window. Oscar has had so much fun doing his Easter arts and crafts and we have lot’s of fun activities to do over the Easter break. It just shows you can have lots of fun and keep the children entertained on a budget. You will have hours if fun! Head to Poundland to see their full Easter range as well as stock up on your Easter eggs. Disclaimer: We were sent vouchers to purchase our Easter art and craft goodies. However all opinions are completely honest and my own. It is not even Easter yet but Oscar has already two Easter Egg Hunts. 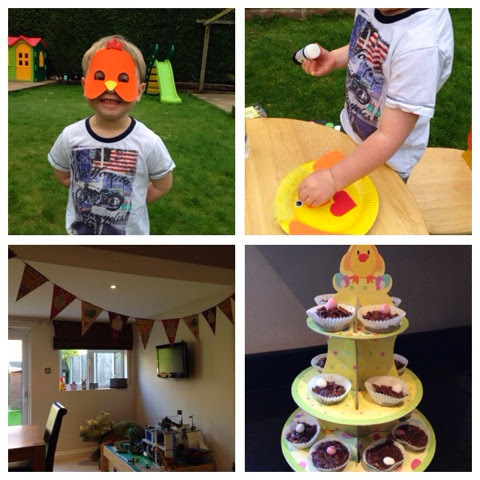 I brought the most adorable Peter Rabbit Easter Egg Hunt Kit from The Little Baby company and when Oscar had a friend to play set them up around the garden hiding little eggs and haribo treats. I got them both rabbit ears from Waitrose for them to wear as well. They had great fun finding their eggs and then eating them! Oscar is really excited about the Easter Bunny coming on Sunday and I have got some great Peter Rabbit and Easter treats for him to find on his hunt. On Oscar’s first Easter his Auntie brought him a Jellycat bunny. I think this is a great child’s gift idea as they are so soft and suitable from newborn. Oscar has quite a long Easter break and filling three weeks of bits and bobs for him to do can sometimes be quite difficult. So when I went into Poundland last week to see what they had in for Easter I was blown away by their huge selection of Easter arts and craft sets. Over the last week we have been none stop making puppets and bunting and Easter masks. All the craft kits that I brought came with everything you needed inside, so no half made bits and bobs when you realise you are missing something. Even the sewing kits came with a plastic sewing needle. Oscar really enjoys making things and painting! 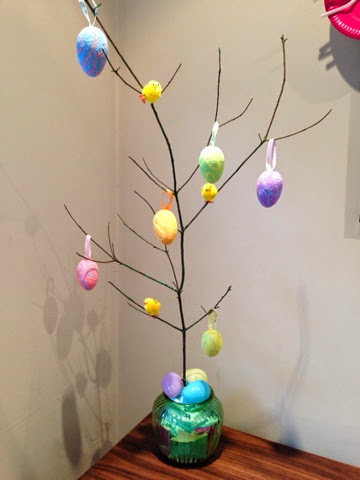 I also brought some egg decorations and fluffy chicks from Poundland and we went off hunting for the perfect twig then made our own home made Easter tree decorating it with glitter. I think it looks quite good. We also decorated plates to hang in our hall way next to the tree which was also from a craft kit. Each craft kit has a full step by step instruction guide inside and pictures to copy so they are perfect for any age. 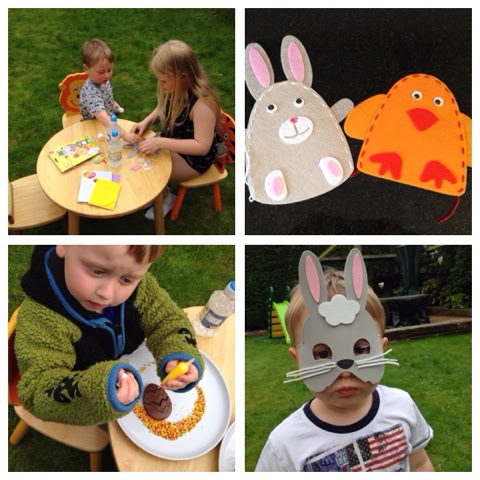 Oscar had friends around yesterday and whilst the bigger boys were playing football Oscar and his friend Stevi made bunny and chick puppets and Easter baskets to collect their eggs in when they have an Easter Egg Hunt on Easter Sunday. I also got a cuddly chick and a solar powered moving chick to put in Oscar’s bedroom to add a bit of decoration. The Easter garland making kit is great as you have to stick the letters on so it gave us a chance to practice Oscar’s letter sounds at the same time. I think Oscar’s favourite activity was the chocolate egg decorating that came complete with icing and sprinkles. 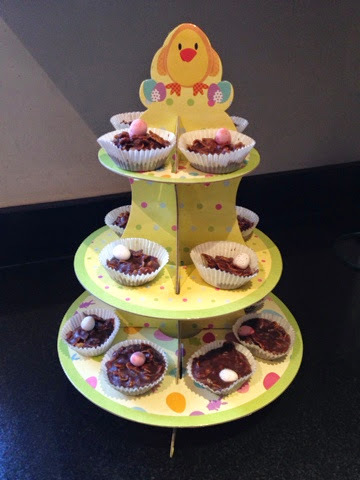 We also made chocolate cornflake cakes and put them on our cup cake stand for when Nanny and Grandad comes around this weekend to see us. I just can’t believe all these bits are really only £1! I also got some cute Easter crackers for Oscar to have with Easter Lunch. Poundland also have a huge range of Easter baskets, cards, wrapping paper and gift bags so head to Poundland this week to have a fun, crafty and cheap rest of the Easter holidays! Disclaimer: I was sent a voucher by Poundland to purchase these items but I choose the items myself and all opinions are my own. Happy Easter!